The new colour version of Munchkin Bites! Be vampires...and werewolves...and snotty faerie changlings. Any similarity to an angsty roleplaying game is strictly coincidental...and roleplaying is strictly accidental. You're here to KILL things! For those familiar with all things Munchkin, Munchkin Bites introduces a new kind of card - Powers! 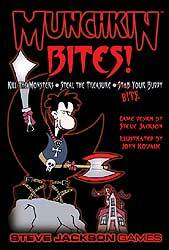 It starts with John Kovalic's Dork Tower characters in their vampire guises! This is a stand-alone game, but of course it can be combined with other Munchkin games. So bring along your Coffin and wield the Sword Of Beheading People Just Like In That Movie. Face the Banshee, the Heck Hounds and the dreaded Were-Muskrat. Smite them all and be the first to level 10!